Summer 2016 saw WELTEC BIOPOWER go live in in Varazdin, northern Croatia. The 250kW plant of the pig farmer Dalibor Vrček perfectly suits the farm's cycle of food production, liquid manure utilisation and energy production in the form of power, heat and fertiliser. The slurry from a newly erected pigsty with 130 sows and 2800 porkers forms the basis for the energy production. Croatia had already had committed itself to the EU climate protection goals in order to establish the preconditions for obtaining subsidies for decentralised energy projects in rural areas, before they officially joined the EU in 2013. With these grants and fixed feed-in tariffs for green power, the Croatian government intends to increase the share of renewable energy by about 30% by 2030. The framework conditions for this are excellent, as Croatia has a generous supply of biomass. Biomass is one of the country's most important renewable energy sources. Thus, biogas plants can effectively contribute, not only to the utilisation of agricultural products, but also to the digestion of leftovers and waste from the food industry. 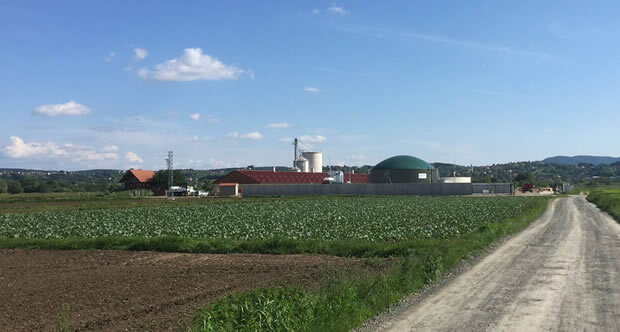 Pig breeder Dalibor Vrček's family-managed farm also had ideal conditions for establishing a synergy of animal husbandry and biogas generation. In addition to the subsidy for the construction, the operator was able to base his investment decision on a fixed feed-in tariff of €0.19 per kw/h of power fed in over the next 14 years. This income forms a solid basis for diversifying his business. "We expect a feed-in of two million kW/h per year. Thus, we have created a third solid pillar besides agriculture and feed production as well as pig fattening and direct marketing", commented Vrček, on the further economic and ecological development of his farm, which had been founded back in 1990. The farm's infrastructure is highly suitable for the new business field. Before the pig slurry is pumped into the 1,716m³ stainless-steel digester, it can be stored in an existing upstream slurry store. In view of the liquid manure share, a small 35-m³ input system is sufficient for transferring the solid substances, such as maize silage. The entire digestate is used as fertiliser on the farm's fields, which amount to more than 300ha. The smart heat utilisation of the 250kW CHP unit serves as an additional source of income, thereby contributing to the efficiency of the plant operation. Tihomir Pajtak, who supervises the project on site as WELTEC BIOPOWER's sales partner, considers the development of the family operation as a trend-setting concept in Croatia, as the focus on biogas for heat and power production is on the rise throughout the country. Pajtak explained: "Currently, about 20 biomass and biogas plants with a total capacity of more than 21MW are online, two figures that are bound to grow. Additional plants with a planned capacity of 67MW have already been approved. The plant capacity is to be doubled within four years.” Using reliable plant technology such as the solutions offered by WELTEC BIOPOWER, the southeast European country will easily reach the EU climate protection goals.